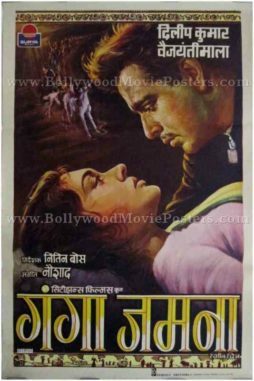 Vintage Bollywood movie poster for sale of the cult Hindi film, Madhumati (1958). This is an actual surviving old Bollywood publicity poster of the 1958 Bimal Roy classic, which featured Dilip Kumar and Vyjayanthimala in lead roles. Madhumati won 9 Filmfare Awards in 1958, a record held for 37 years, making this old Bollywood poster highly collectible! 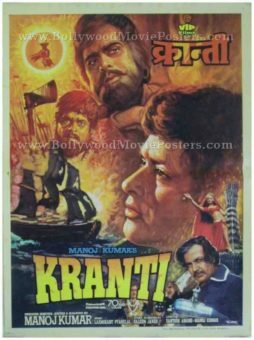 Printed and circulated somewhere in the early 1970s, this old Bollywood poster was originally designed for publicity of the subsequent release of the film but never ended up being used. 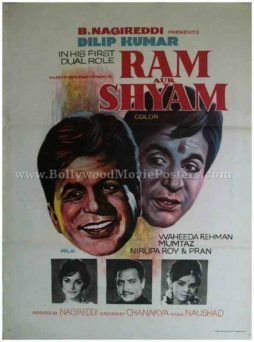 This poster was originally hand painted on canvas by leading Bollywood movie poster artist C. Bakshi, making it very collectible. The poster features four of the key characters from the film, who are duly credited on the top. 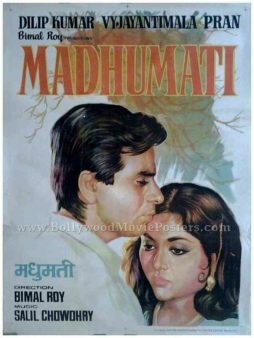 Tragedy King of Bollywood, Dilip Kumar is seen in a large close up portrait prominently in this Madhumati poster. A stunning portrait of actress Vyjayanthimala appears alongside. Bollywood poster painter C. Bakshi uses an “overpainting technique” of painting over photographic stills in this old Madhumati poster. 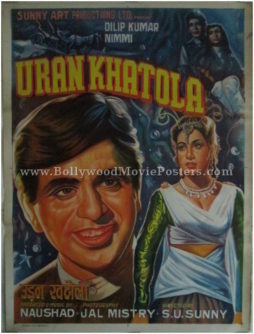 Smaller portraits of Pran and comedian Johnny Walker are seen at the bottom of this vintage Bollywood poster for sale. Madhumati is a 1958 Hindi film produced and directed by Bimal Roy – who is considered as one of the most influential filmmakers in Indian cinema. The film starred Dilip Kumar and Vyjayantimala in lead roles along with Pran and Johnny Walker. Madhumati had a somewhat Gothic noir feel to it with a storyline centered around reincarnation. It spawned several subsequent remakes with a similar theme. The film won the National Film Awards for Best Feature Film in Hindi and nine Filmfare Awards, including Best Film, Best Director, Best Music Director, Best Female Playback Singer, Best Dialogue, Best Art Direction, and Best Cinematographer. The soundtrack of Madhumati was a stellar success with songs from the film becoming a rage throughout the nation. 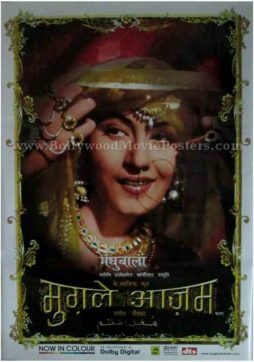 This old Madhumati poster capitalizes on the success of the album by announcing the lyrics of five popular tracks from the film below the title namely, “Zulmi Sang Aankh Ladi” and “Ghadi Ghadi Mora Dil Dhadke” sung by Lata Mangeshkar, “Suhana Safar Aur Yeh Mausam Haseen” sung by Mukesh, “Dil Tadap Tadap Ke Keh Raha Hai” by sung Mukesh and Lata Mangeshkar and lastly “Jungle Mein Mor Nacha” sung by Mohammad Rafi. Old Bollywood poster of the hit Hindi film Aan (1952) for sale. 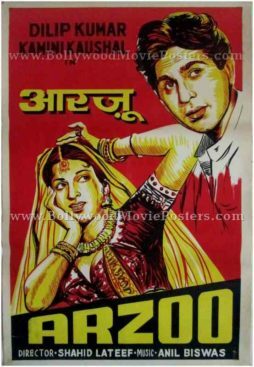 This is an actual surviving old Hindi movie poster of India’s first technicolour film, Aan (1952) which starred Dilip Kumar & Nadira in lead roles. 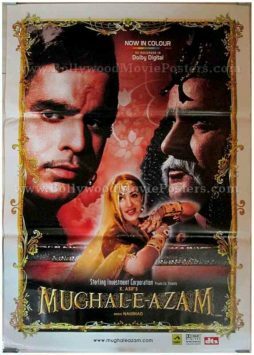 Printed and circulated a few years after the original first release of the film (somewhere in the late 1950s), this vintage Bollywood poster was printed for publicity of the film but never ended up being used. This vintage Bollywood poster was originally designed in hand painted oil on canvas format by a small time art studio in Delhi, making it highly collectible. 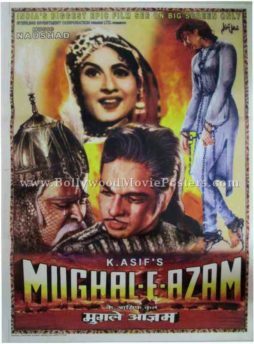 The poster features a quirky portrait of Dilip Kumar standing in a heroic avatar. The background has been painted using a combination of red and yellow, giving it a stunning appearance. Title of the film is seen in red, prominently set against a yellow background. A large hand drawn Mehboob Productions logo, comprising a communist hammer and sickle, is seen in white and yellow on the top left. Aan was produced and directed by Mehboob Khan at an extremely large budget for its time. Besides receiving the distinction of being India’s first Technicolour film (shot in 16mm Gevacolour and later blown up in Technicolor), Aan was one of the first Indian movies to have a worldwide release. In the US, Aan was released under the name “The Savage Princess.” The film was later dubbed in French and released in 1954 in France as “Mangala, fille des Indes” (Mangala, girl of India). The film starred Dilip Kumar, Premnath, Nimmi and marked the debut of Jewish actress Florence Ezekiel Nadira (simply known as “Nadira”). 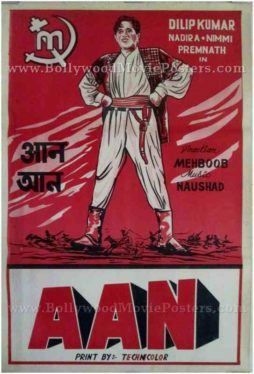 Vintage Bollywood poster of the hit Hindi film Aan (1952) for sale. This is an actual surviving vintage Hindi film poster of India’s first technicolour film, Aan (1952) which starred Dilip Kumar & Nadira in lead roles. 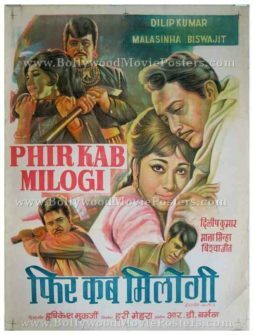 Printed and circulated a few years after the original first release of the film (somewhere in the 1960s), this vintage Bollywood poster was printed for publicity of the film but never ended up being used. This vintage Bollywood poster was originally designed in hand painted oil on canvas format by a small time art studio in Kolkata, making it highly collectible. 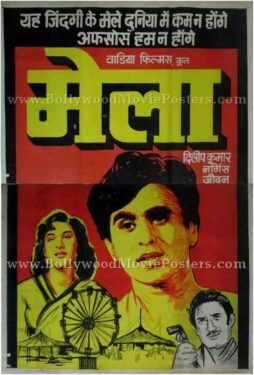 The poster features a quirky portrait of Dilip Kumar standing in a heroic avatar. As was the norm with localized posters of the era, this vintage Bollywood poster has been designed and printed in a single color (understandably to save on design and print costs). Very rare original vintage Bollywood poster of the hit Dilip Kumar film, Jugnu (1947) for sale. 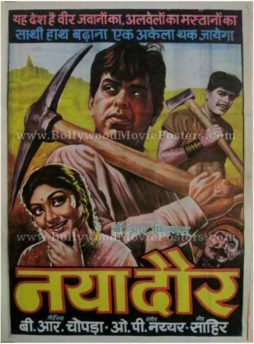 This is an actual surviving publicity poster featuring the ultimate method actor of Bollywood Dilip Kumar in his first stellar performance, making it highly collectible. This landmark film was the first major hit for Dilip Kumar who went on to become one of Bollywood’s biggest sensations in the years to come. 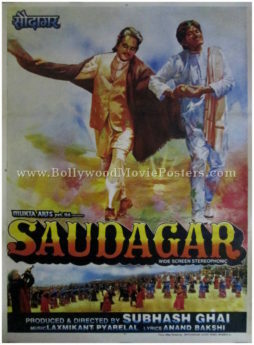 This rare Bollywood poster was originally designed on a hand painted canvas by a well know Bollywood poster painter. Stunning portraits of lead actors Dilip Kumar and Noor Jehan are seen set against a light orange background. The title of the film appears in English with translations into the two major regional languages, Devanagari Hindi and Urdu appearing alongside. 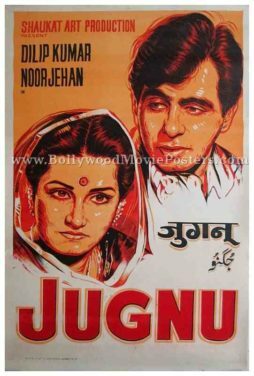 Jugnu is a 1947 Bollywood movie starring the Tragedy King of Bollywood, Dilip Kumar & Noor Jehan in lead roles. The film also features singing superstar Mohammed Rafi as an actor in a small role. Jugnu was released during India’s independence. The director of Jugnu, Shaukat Hussain Rizvi and his wife actress Noor Jehan settled in Pakistan shortly after the film was released. 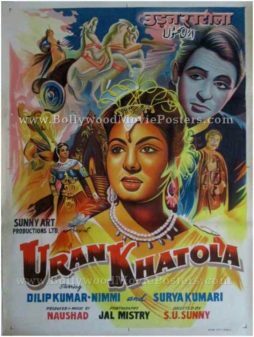 Very rare original old Bollywood poster of the 1955 Hindi film, Uran Khatola for sale. 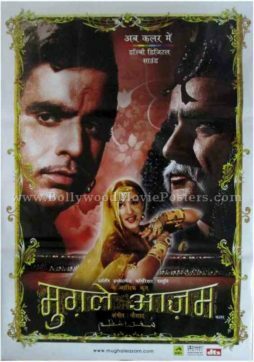 This is an actual surviving vintage Bollywood poster of the 1955 classic produced by music director Naushad, which starred the ultimate method actor of Bollywood, Dilip Kumar in the lead role. This artistic hand painted Bollywood poster features stunning portraits of lead actors Dilip Kumar and Nimmi. 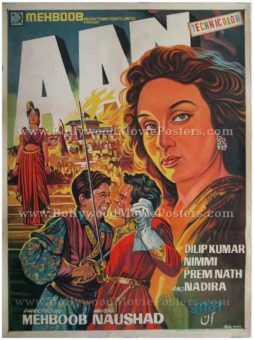 Extremely rare vintage Bollywood movie poster of the hit Hindi film, Aan (1952) for sale. This is an actual surviving old publicity poster of India’s first technicolour film, Aan (1952) which starred Dilip Kumar & Nadira in lead roles. 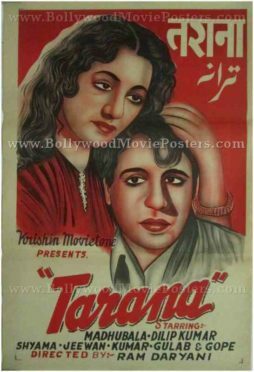 Printed and circulated during the first release of the film (somewhere in the early 1950s), this old Bollywood poster was printed for publicity of the film but never ended up being used. This vintage Bollywood poster was originally designed in hand painted oil on canvas format, making it highly collectible. The poster features a stunning close up of actress Nadira on one side. Dilip Kumar and Premnath appear locked in a sword fight at the bottom. 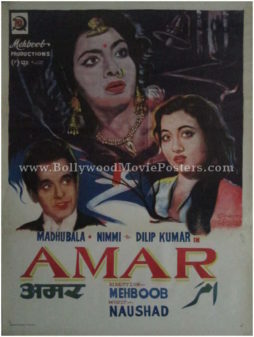 Extremely rare hand painted original vintage Bollywood movie poster of the hit Hindi film, Madhumati (1958) for sale. 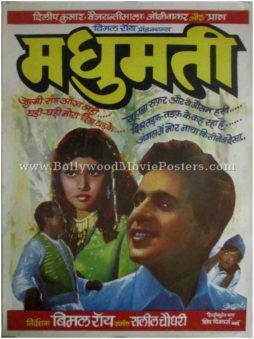 This is an actual surviving old Bollywood publicity poster of the 1958 Bimal Roy hit, which featured Dilip Kumar and Vyjayanthimala. Madhumati won 9 Filmfare Awards in 1958, a record held for 37 years, making this poster highly collectible! 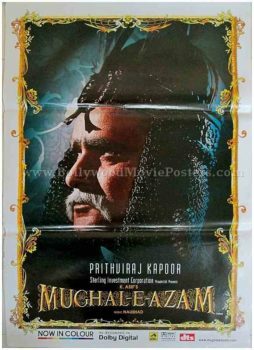 Printed and circulated during the first release of the film (somewhere in the late 1960s / early 1970s), this old hand painted Bollywood poster was originally designed for publicity of the film but never ended up being used. 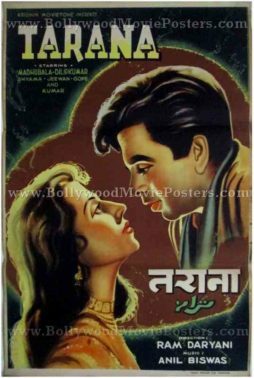 The poster features a large hand painted side profile of the Tragedy King of Bollywood, Dilip Kumar. A stunning portrait of actress Vyjayanthimala appears alongside. The artist has used a very restrained, minimal approach during the design of this hand painted vintage poster. 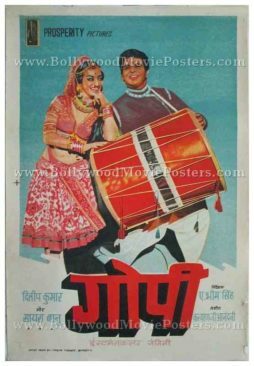 Old hand painted Bollywood movie poster of the blockbuster Hindi film, Gunga Jumna (1961) for sale. 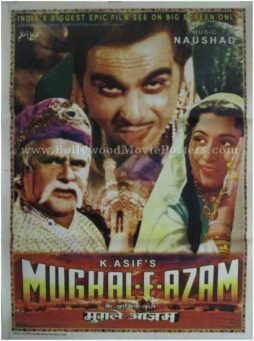 This is an actual surviving vintage publicity poster of the 1961 film that featured the “Tragedy King” and “Ultimate Method Actor” of Indian cinema, Dilip Kumar in the lead role. Gunga Jumna was one of the biggest hits of the 1960s and bagged several awards. The film’s unique theme catapulted it to cult status. 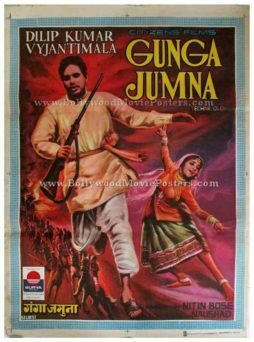 Many sources have ranked Gunga Jumna as a must see film and included it in the top 100 Indian cinema hall of fame, making this poster highly collectible. 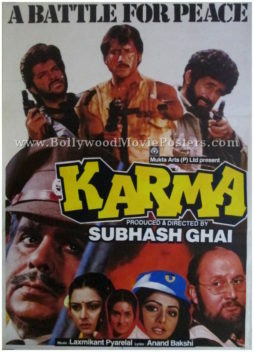 Printed and circulated two decades after the first release of the film (somewhere in the late 1980s), this old Bollywood movie poster was originally designed for publicity of the re-release of the film but never ended up being used. 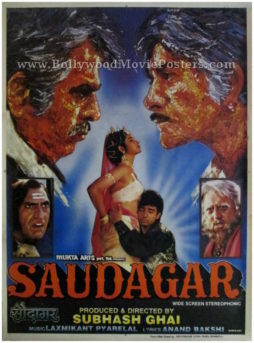 In this hand painted Bollywood poster, Dilip Kumar is seen holding a rifle, whereas actress Vyjayanthimala appears in a dancing pose alongside.